On December 21, when the Sun is almost directly above Réunion, France, South Indian Ocean, the Sun is about to set in Dunedin, New Zealand. And elsewhere, in Punta Arenas, Chile, the Sun has just risen. 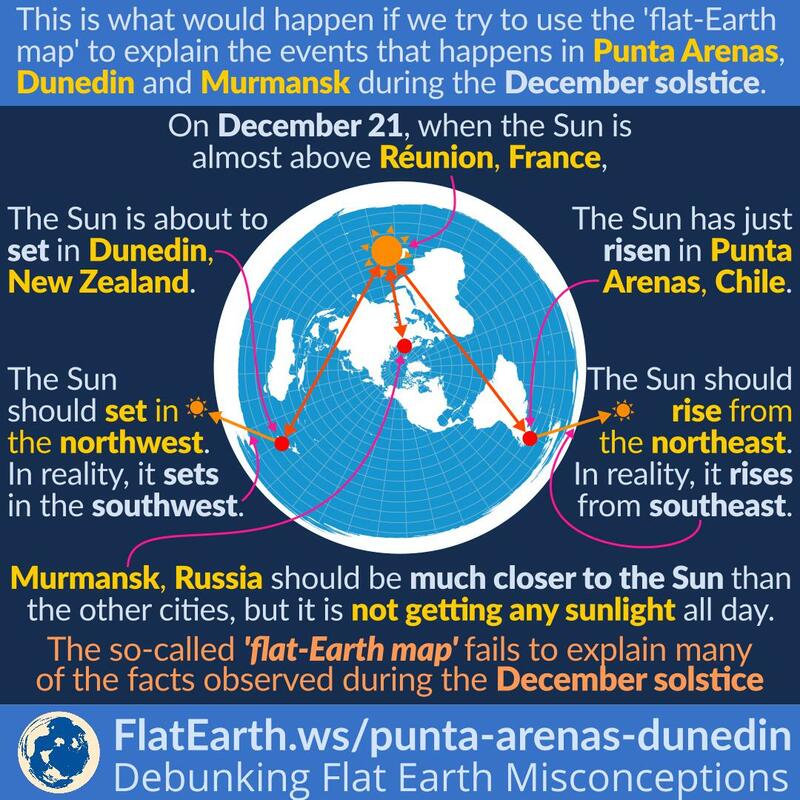 According to the so-called ‘flat-Earth map,’ in Dunedin, the Sun should set in the northwest, but in reality, the Sun sets in the southwest. And the situation is similar in Punta Arenas, Chile: according to the ‘flat-Earth map,’ the Sun should rise from the northeast, but in reality, it rises from the southeast. Now we’ll direct our attention to the city of Murmansk, Russia. According to the ‘flat-Earth map,’ Murmansk is much closer to the Sun than the other cities, and thus should be getting more sunlight. In reality, Murmansk is not getting any sunlight at all, all day. Not just that, the Sun almost never shines in Murmansk during the entire month of December. On the other hand, Dunedin and Punta Arenas are among the farthest cities from the sun, but they are experiencing the peak of summer, and the sun is shining more than 15-16 hours in a day. All these cities, Réunion, Punta Arenas, Dunedin dan Murmansk, are not huge metropolises, but each has the population of more than 120 thousand. It should be not hard for anyone —including flat-Earthers— to verify all the mentioned facts.